This week at Lisa's Blogger Challenge, it's BLING IT ON! I bought sheets of bling from the Mon Ami Gabby booth a while ago and haven't gotten into them until now. She said you could die cut it, and yea baby, it works! Using distress inks, I sponged on the yellow and blue inks. I applied embossing paste thinly thru the ray stencil, and the yellow bled thru perfectly. Then I went back with the edge of the blue dabber and pulled the ink between the sun rays. Very cool tag! 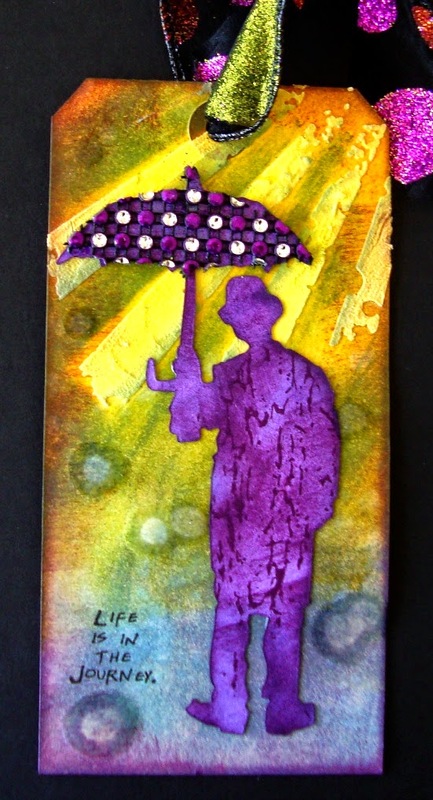 Love the colors and added bling to the umbrella. Those rays from the stencil turned out perfectly! Gerrie, this is absolutely stunning! I love that regal purple for your focal image, and that sunshine is pure gold! I haven't heard of bling coming in sheets, but after looking at this, it goes on my "where can I find THAT" list! You need to submit this for publication, my friend! Yep! That good! Love these colours together and those rays... wow ! Imagine bling on a sheet! Love the fact that Mr Umbrella Man has been blinged LOL. Great colour palette .... great tag. Gerrie I love this one. Such beautiful colors. I love learning from you and Lisa. great tag Gerrie haven't seen Charlie there around for awhile missed him.